As well as the cricket, there will be another Balconiers’ Special Buffet Evening. This will take place on Friday 5th August in the St. Helen’s Clubhouse. This year’s evening will be a celebration of our President, Don Shepherd. In particular Dr. Andrew Hignell will be looking back 50 years and focussing on Don’s decision to change his bowling style – with devastating and record-breaking results! Further details, including cost and ticket information to follow. Put the date in your diary now! The 50th Anniversary of Glamorgan’s famous victory over the Australian Tourists was marked by a special evening event at St. Helen’s during the 2014 Cricket Festival. Former captain Ossie Wheatley was one of a number of special guests as over 120 people attended to celebrate the occasion. 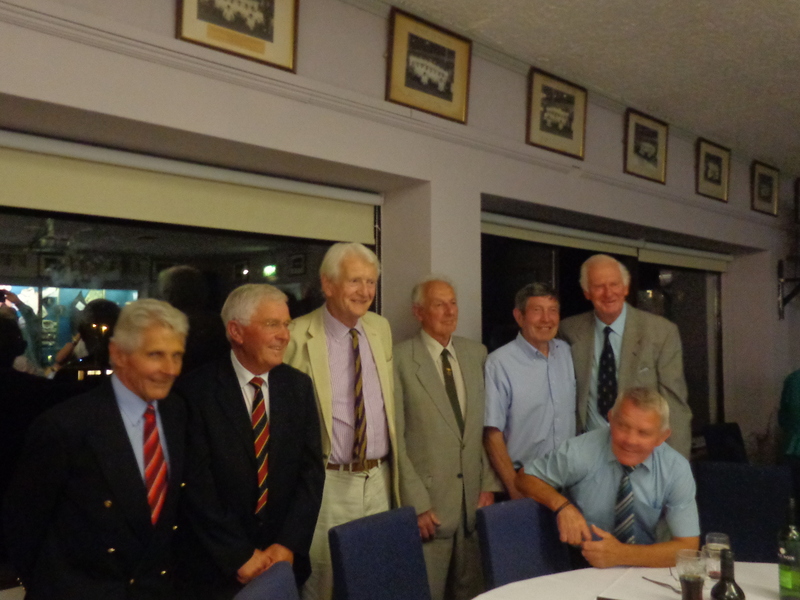 Glamorgan’s popular ex-captain was joined by six other members of the team that played in this historic St.Helen’s match – Don Shepherd, Alan Jones, Eifion Jones, Alan Rees, Billy Slade and Peter Walker. All the players took part in a very interesting question and answer session led by the BBC’s Edward Bevan. There was also a presentation by Dr. Andrew Hignell about the match with archive footage of the game itself showing some of the impressive bowling and spectacular fielding which clinched the game for Glamorgan. Ossie Wheatley led the county between 1961 and 1966, and on joining took the captaincy from Wilf Wooller. With his right-arm fast-medium bowling he formed an impressive attack with Jeff Jones. In his first two seasons with Glamorgan he took over 100 wickets. However it was with a less experienced side, (a number of which attended the celebratory evening) having rested some players, and during a not particularly special county season that Wheatley’s team achieved this magnificent win. Thoughtful captaincy and the side’s desire to test out the Tourists led to a very proud moment for Wheatley as Glamorgan captain when his side became victorious over the Australian Tourists in their game at St. Helen’s, Swansea. Crowds of around 20,000 were at St. Helen’s that day to watch the momentous occasion. The full scorecard of that match can be seen here and an article on Ossie Wheatley and that momentous game can be found on the St. Helen’s Articles page.